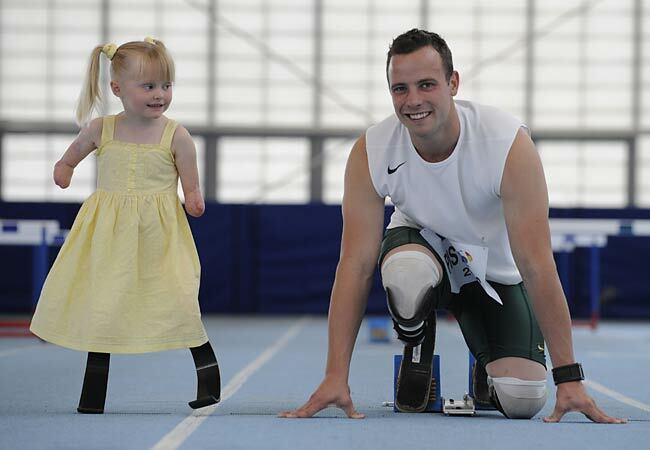 South African Olympic racer Oscar Pistorious is shown in the picture above about to race a little girl named Ellie Challs. Pistorious is a double amputee who made it to the semi-final of the men’s 400m event at the ongoing London 2012 Olympic Games. He was 11 months old when doctors discovered he had no fibulas, requiring below-the-knee amputations to be carried out on both his legs. The young girl in the photo, from Essex, England lost her four limbs to a severe case of meningitis at 16 months. She was the youngest person to ever be fitted with carbon fibre prostheses in 2009 at the age of 5, when her community raised the $15,000 needed to replace her original standard prosthetics which she found difficult to walk with.